You ever feel like a tool? No, not that kind of a tool. I’m talking about the kind of tool who is used and abused by the system (or the ‘Man’ if you will), only to return for more of the same day after day. It’s made especially tough when you’ve got half-wits throwing sand into the machinery because they don’t take a moment to think things through before they act. Why do we put up with it? We definitely do it for more than a paycheck, I can tell you that. We do it because we believe we can make a difference, at least a little. We have faith in what our system tells us about good and evil. 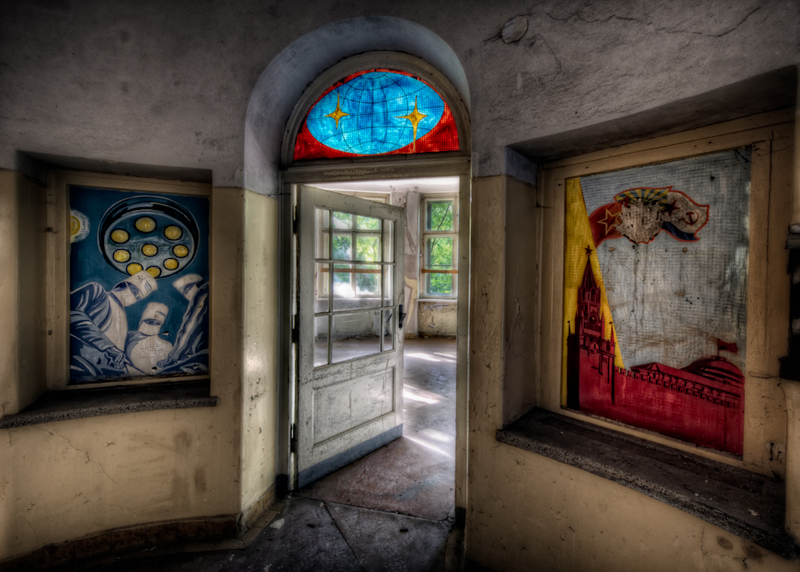 When I stood in this space, I thought of all the soldiers who must have come through this old Soviet hospital through the years, believing what the Commissar told them about being defenders of the faith. Knowing what they did at the end, would they do it all over again? Would we? Eyal – Wow! This is a phenomenal shot. Well composed and perfect processing. Love the posters and the door beckoning you to enter it. Very, very well done. Bob Lussier – Again, your writing compliments your image so well. Great work! Brian Matiash – There is so much greatness here, my man. You are doing wonders with how you are elevating this blog. Keep it up. Heath OFee – I’m with Brian here, Jacques. I’m always thoroughly excited when I see that you’ve posted something new, your words and images are truly inspirational. Please, keep it up. Jacques – Thanks so much, fellas! I really do appreciate those very generous words. I’ll do my best to keep things interesting. I’m hoping to get out saturDay to shoot some more work for the blog, so I’m trying to figure out what I need for the next week of posts to make the most of the limited time I have to shoot. Bobann – Amazingly beautiful. Thanks for this.